Peter Marks Electro, Synthpop The mind is out of the box, my friends. There's a new emotion prominently featured from our pair of technicians: anger. All the restraint shown on previous albums has been shown the door and in it's place we're witness to a much leaner, hungrier sound from Mind.In.A.Box. Forget the detour of 'R.E.T.R.O.' (a lovingly forged trip down memory lane) because we're back into the darkened world of strobes and silicone with 'Revelations', this is not some bunch of amateurs any longer, the story arc has now reached a climactic point from which there is no escape or pulling back from. You'll dive into the complexities of creativity completely let off the chain; their musical metamorphosis which was begun on their third album, 'Crossroads', continues unabated. The live appearances which they have made clearly have had a major influence on how they now sound, live percussion and guitars are methodically massaged into the nexus of 'Revelations' while the lyrics are at their most exposed. 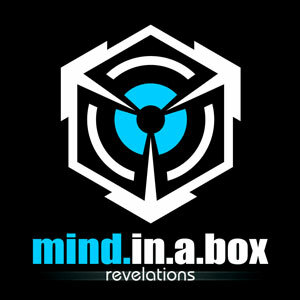 Mind.In.A.Box have often been knocked for their usage of vocoders and other vocal effects but this time you'll hear everything nice and sparkling clear. So when the opener "Remember" pleads "How could you let it end like this, now all I do is sit around and reminisce" there's no confusion over the characterization, it's Poiss who's giving vent to his pain and regrets. This is easily their most graceful release yet, the soul of the machine is freely moving about the cabin as we're on this voyage. The songs themselves continue the most endearing tradition of this band: they take their time developing. You don't get the straight white knuckle punch of what these chameleons are truly about until the tale has been recited to a point where it makes sense to deliver the payoff. It is their utter capitulation to the logic of technology while somehow simultaneously saturating this pristine mechanized reality with vivid emotional intensity which has made them stand outs for years on end. But don't get too worried about them abandoning what drew so many to them in the first place, there is atmosphere and beats to spare on here. Mind.In.A.Box I suspect understand their audience quite expertly and so know precisely when to turn up the dynamics so that their words hit with maximum effect. The looseness and grit I've noticed seeping into their overall final product is put to bone-crushingly powerful use. Each channel of the equalizer is massaged and gently persuaded to capitulate, once this is accomplished you get your shivering reward in spades. Poiss continues with his prescient penchant of changing tempos numerous times within a single song, there's not going to be any break out club killers to be found on 'Revelations'. What you will discover is an almost tidal wave of melodies which shift restlessly, receding and then recurring at an alarmingly intense rate. The mind is out of the box, my friends. There's a new emotion prominently featured from our pair of technicians: anger. All the restraint shown on previous albums has been shown the door and in it's place we're witness to a much leaner, hungrier sound from Mind.In.A.Box. Forget the detour of 'R.E.T.R.O.' (a lovingly forged trip down memory lane) because we're back into the darkened world of strobes and silicone with 'Revelations', this is not some bunch of amateurs any longer, the story arc has now reached a climactic point from which there is no escape or pulling back from. You'll dive into the complexities of creativity completely let off the chain; their musical metamorphosis which was begun on their third album, 'Crossroads', continues unabated. The live appearances which they have made clearly have had a major influence on how they now sound, live percussion and guitars are methodically massaged into the nexus of 'Revelations' while the lyrics are at their most exposed. Visionaries sleekly moving through this world, drawing little attention yet how they shimmer when discovered... Mind.In.A.Box. Revelations.